The Snook Fishing has been really good. 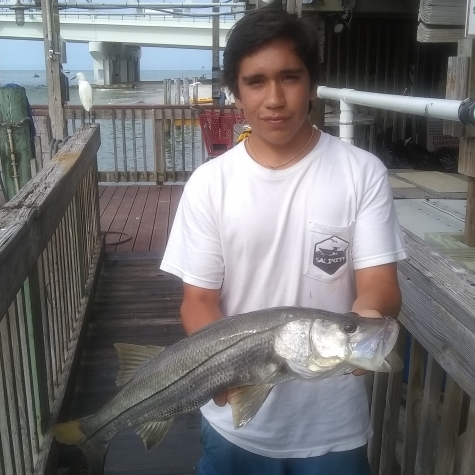 The Snook are leaving the bays and moving through the passes to the beaches to get ready for their summertime spawning and are in big numbers. Usually they are very hungry and want to fatten up for their spawn so they will eat almost any bait you present. The place to catch these big breeder fish with light tackle is the beach. It is my favorite way to catch big breeder snook on light tackle and can put up a good fight. Either a couple hours before sunset or a couple hours after sunrise will get you tight. I recommend using 10-30lb braided main line with 50lb flourocarbon leader matched with a hook depending on size of bait. Using this method you can also pick up some Tarpon crusing by the beach and cast your bait in front of the the pod of fish. Offshore the Red Snapper and Gag Grouper are biting really good. Opening season for Red Snapper and Gag Grouper have been producing good fish. The best bait for the Red Snapper is chunks of Bonita or chunks of threadfins. For live bait apinfish will work well for the larger Red Snapper. The Gag Grouper have been biting really good on the chunked bait too but the big Gags prefer big live baits such as the pinfish or grunts.